I'm still struggling with the “jump one ahead” pattern that often appears on the 3rd line, and I've got two quick questions from one of my latest games. First, what are the possiblities for Black now if he wants to try to control the top side (i.e. 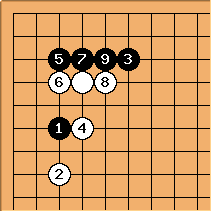 make it uneasy for White to establish a group there) ? 1) The sides adjacent to this corner already are the least interesting at the moment in my opinion. There are wide open areas elsewhere on the board. 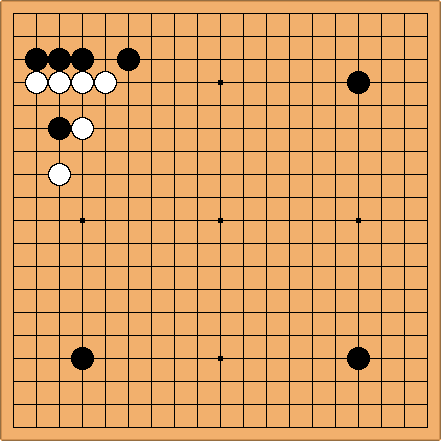 My problem with ignoring was that I feel like after White captures Black would have to add a move on top, e.g. 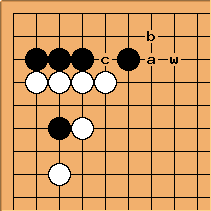 at the hoshi, so the capture's more or less sente for White and it's a trade between territory in the corner and a moyo on the top side. Do you think it's still profitable for Black ? Also I indeed realized after the game that the top side wasn't particularly attractive. I should have been clearer, my question was, were Black to want to fix his cutting aji to prevent a White move around w, where can he play ? Maybe a-c ? With you are stronger along the top side in a natural way. I guess this is too simple to consider for many. Black's move on the top side is at "a". You can also simply answer. Early in the game the fact of being 100% alive is worth more than the 4 point endgame sente you lost. Otherwise it would not be called endgame. Without it, a checking move by white at the top will include some pressure on the corner. After the endgame exchange that extra value of a move at the top is lost.